Greenhorns presents: GPS for Beginners. This workshop will go over the basics of making online digital maps of farm properties using a combination of handheld digital devices (GPS or smartphone) and online satellite and other imagery. We will discuss the most efficient ways to use and combine and manipulate these sources. We will look at additional data layers that can be added to a digital map such as information about elevation, slope and aspect (which direction a slope faces) as well as soil maps, tax maps and historical maps. We will also review a few software packages that can assist in farm management and the process of importing our digital farm maps into their management environments. If time allows, we will go over the use of drones to build very high res maps of farm properties. Our teacher is Markley Boyer. Markley has made maps for the Wildlife Conservation Society of a new national park system in Gabon, and mapped the historic ecosystems of Manhattan Island for the book Mannahatta. Leave a Comment on Greenhorns presents: GPS for Beginners. This month we are looking for artwork submissions for the much anticipated fourth volume of the New Farmers Almanac, reflecting on the success of the Faith Lands gathering and reminding you of our much anticipated summer line-up! We’re seeking black & white photographs, sketches, illustrations, picture essays, maps, natural world paraphernalia, and other original art for the New Farmer’s Almanac, Vol IV. 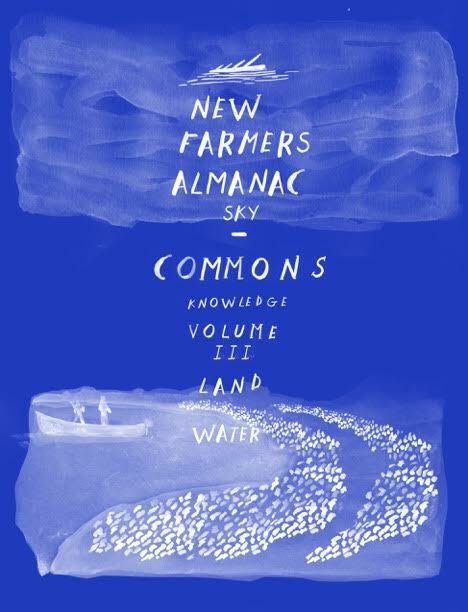 Glance at an overview of themes here, or email almanac@greenhorns.org ASAP with your ideas, questions, sample work, and/or links to your portfolio. Greenhorns and our sister organisation Agrarian Trust recently collaborated to hold the successful Faithlands conference in California. We would like to sincerely thank the Globetrotter Foundation for generously supporting and Paicines Ranch for graciously hosting. Claiming Rights: Claim the right to food and freedom from want, and end racialized systems of oppression. Fair Compensation: Demand fair prices for farmers, fishers and other producers, no stolen wages, and fair wages for everyone. Food Sovereignty: Resist harmful practices and policies, and build just and sustainable local & regional food economies. Click HERE to learn more about Food Week of Action 2018. June 10th: Greenhorns Presents: GPS for Beginners – ONLY 5 DAYS LEFT TO REGISTER!! This workshop will go over the basics of making online digital maps of farm properties using a combination of handheld digital devices (GPS or smartphone) and online satellite and other imagery. We will discuss the most efficient ways to use and combine and manipulate these sources. We’ll study additional data layers that can be added to a digital map such as information about elevation, slope and aspect (which direction a slope faces) as well as soil maps, tax maps and historical maps. We’ll also review a few software packages that can assist in farm management and the process of importing our digital farm maps into their management environments. If time allows, we will go over the use of drones to build very high res maps of farm properties. 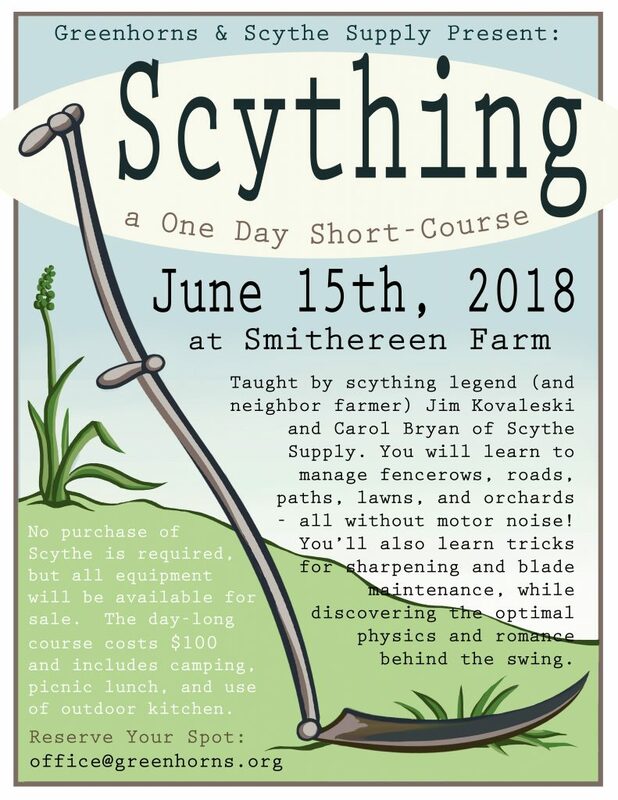 June 15th: Greenhorns and Scythe Supply present: One day short course in scything. 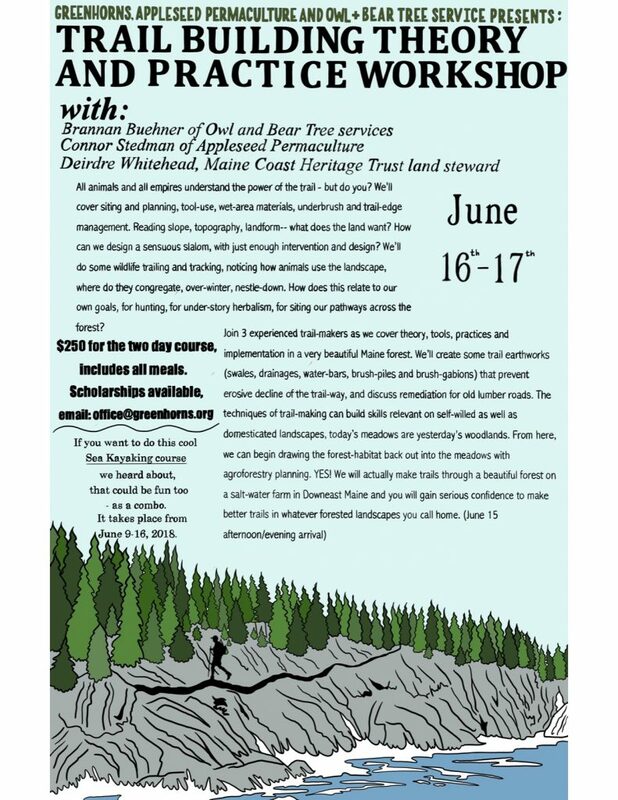 Join 3 experienced trail-makers as we cover theory, tools, practices and implementation in a very beautiful Maine forest. We’ll cover siting and planning, tool-use, wet-area materials, underbrush and trail-edge management. Reading slope, topography, landform– what does the land want? How can we design a sensuous slalom, with just enough intervention and design? We’ll do some wildlife trailing and tracking, noticing how animals use the landscape, where do they congregate, over-winter, nestle-down. How does this relate to our own goals, for hunting, for under-story herbalism, for siting our pathways across the forest? Join Sarah Redmond to learn more about the the relationship between humans and seaweed over the course of history and explore what comes next. This workshop will included presentations, introduction to marine biology, commons resource management methods and more! Farm lunch provided $200/Scholarships available. 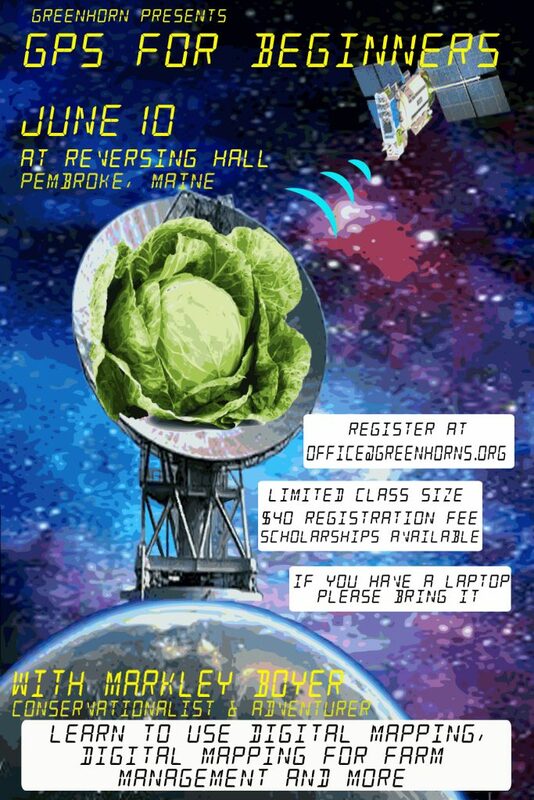 Email office@greenhorns.org to register. All of August: Greenhorns Presents: Blueberry Camp! October 13th: Greenhorns Presents: Wild fruit vinega! Making apple cider vinegar on a homestead scale. Registration required for all classes and workshops, email office@greenhorns.org ASAP to register. The Future of Farm & Food Entrepreneurship Summit 2018 focuses on growing conscious food and agriculture businesses, giving current and aspiring entrepreneurs the tools, resources, and mentorship needed to evolve businesses, create positive change in your community, and revolutionize the future of food. This year Severine will be speaking with Charles Eisenstein. Strolling of the Heifers, the organizer of the Summit, is a non-profit organization based in Brattleboro, with the mission of supporting and sustaining family farms and local food systems by connecting people with healthy local food. We do this through a variety of year-round programs. Best known is our annual Strolling of the Heifers Parade and Slow Living Expo, which takes place during “Stroll Weekend” immediately after the Summit. We also organize a Vermont Farm/Food Business Planning Competition, and we publish the annual Locavore Index ranking the 50 states in terms of their commitment to local food, and other projects and events. 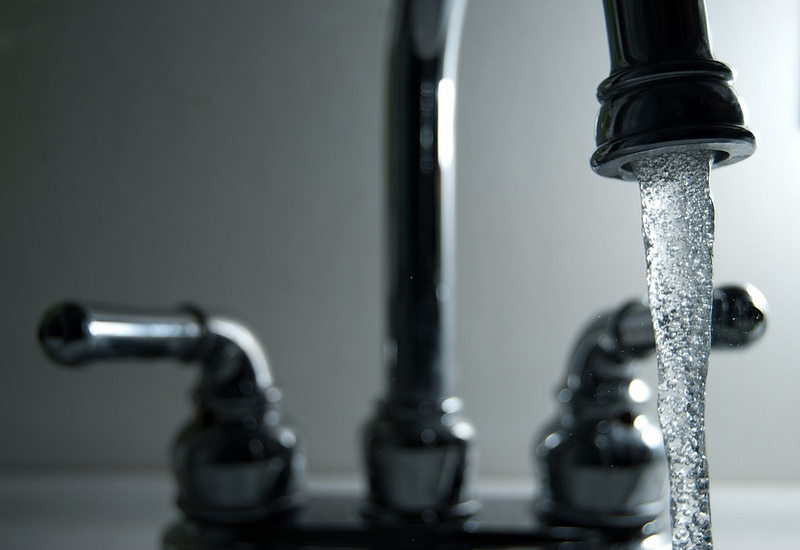 It has recently emerged that a lack of corrosion control in the water system in Pittsburgh has caused dangerously high levels of lead in the city’s drinking water. According to Dr. Marc Edwards, levels recorded in Pittsburgh are even higher than the levels recorded in Flint MI in 2015. A lack of corrosion control was the physical issue in Flint, as it is in Pittsburg. However, that the level of lead was allowed to get to such levels shows an utter disregard for the wellbeing of those affected. Government and private actors tasked to serve the people and provide basic and essential services have failed. It is not surprising to learn that the private company behind the lead crisis in Flint, is behind the current situation in Pittsburgh. Vieola is the worlds largest private supplier of water services. The cities of both Flint and Pittsburgh have taken legal action against Vieola. Charges in flint include: “professional negligence and fraud. These actions caused Flint’s lead poisoning problem to continue and worsen, and created an ongoing public nuisance”. In Pittsburgh, the Water and Sewer Authority sued Vieola in 2016 for the sum of $12.5 million. Charges against Vieola include: gross mismanagement of PWSA’s operations, abuse of it’s position of trust and confidence, and misleading and deceiving PWSA. In an era of increasing water scarcity and rapid urban growth, privatization of water services and resources is a global threat. Privitization can seriously undermine the democratic control and power of the people and the structures of the state. Recent events have shown that water privitization also puts the people at risk of being held hostage by unaccountable mega-corporations who have a monopoly on our most precious resource – water. Read more in the Intercept HERE. There are less than two weeks to go before we kick off our jam packed summer events schedule in Downeast costal Maine! First up on June 10th is GPS for Beginners, led by Markley Boyer. This workshop will be particularly useful for agrarians, young and old who are looking to more efficiently use their land, as well as those interested in cartography and topography. You may be familiar with Farm Hack, started by Greenhorns founder Severine. 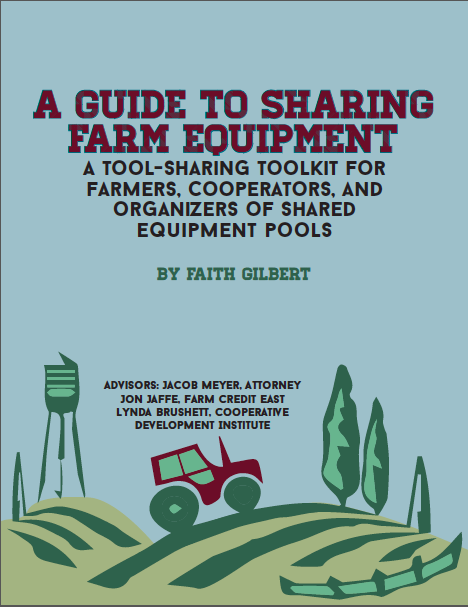 Farm Hack is a worldwide community of farmers that build and modify their own tools (including a few bicycle based tools like the bike tractor). But have you heard about Bicimakina? Bicimakina is a community of makers, educators, and enthusiasts all joined by a common love of human-powered machines. Pedal-powered blenders and hand-cranked grain mills are just a few of the awesome machines that these guys have come up with. Their mission is to create a renaissance of interest and exploration into human-powered technology. 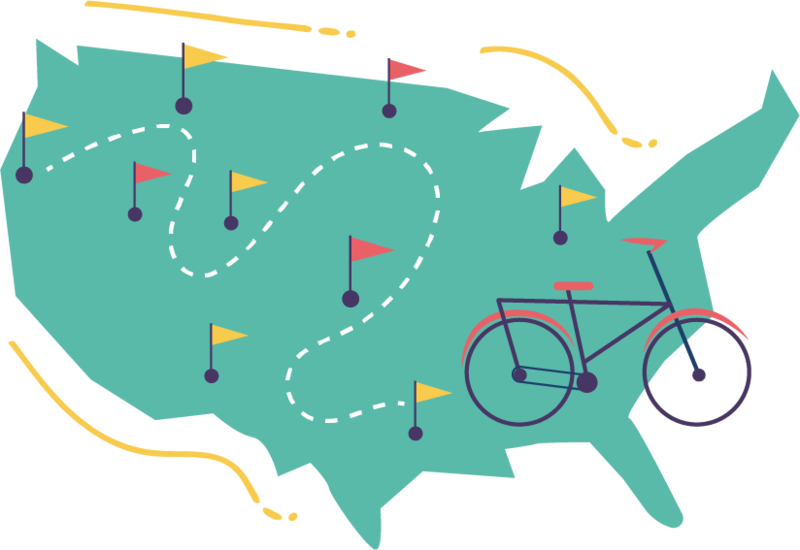 This fall, the Bicimakina team are leaving Oregon and heading across the US on an epic bike trip to find and interview other like-minded Human-Powered Machine users and builders. If you are one of these minded people get in touch with them and tell them about your project and they might just come to you! Their trip will take a year, and their exact route will be determined by the locations of the people who are going to be on the show but their goal is to do a full loop across the US. As you know Greenhorns has recently moved our headquarters to ‘Reversing Hall’ , an old Odd Fellows Hall in Pembroke, Downeast Maine. To celebrate and showcase our beautiful and historic HQ we will be hosting an array of summer workshops and camps that support the entry of young people into sustainable agriculture in Pembroke this summer. No purchase of Scythe is required, but all equipment will be available for sale. The daylong course costs $20 for downeasters/$40 from away, and includes camping, picnic lunch, use of outdoor kitchen. Presentations and Slideshows at the Reversing Hall, field study on the shore. Introduction to wildcrafting and farming edible seaweeds. Look at the history of seaweed aquaculture around the world. Looking at the potential for seaweed aquaculture in Maine: opportunities and risks. Introduction to the work of Elinor Ostrom on the Commons, and principles of community resource management. Introduction to species, ecology, ethics, equipment, siting considerations, seasonality, harvest, processing. We’ll discuss bio-safety protocols, look at seaweed health and disease management strategies. We will talk about local economy, political ecology and learning our lessons from fisheries history in Maine. We’ll discuss what kind of policy is needed create a Maine seaweed sector inviting to young, conservation-minded mariculturists. We will have plenty of time for discussion. 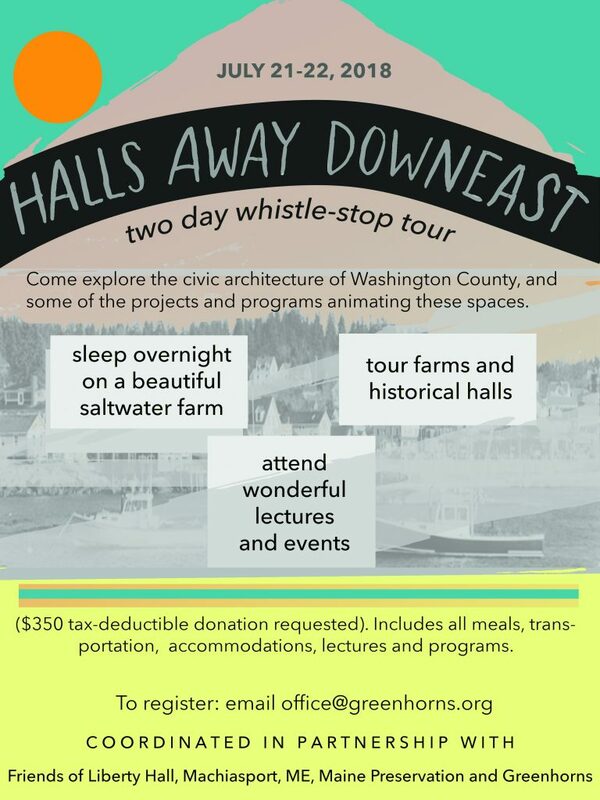 – July 21st – 22nd: “Halls away Downeast” – A bus-your of historic halls from Ellsworth to Eastport, Maine. – All of August: Blueberry Camp! – October 13th: Wild fruit vinega! Making apple cider vinegar on a homestead scale. Emma made a nice calendar online where you can view the full line up. 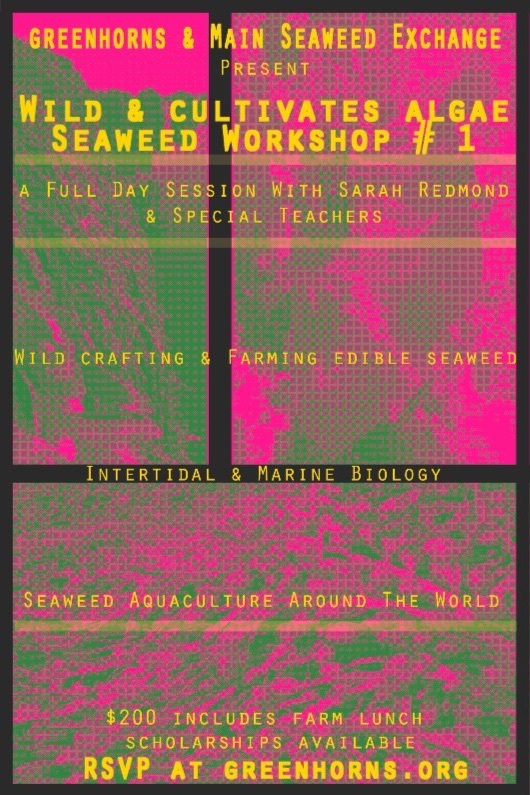 We’ve also got a few hovering workshops on natural beekeeping, oystering and another one on seaweed ecology…so stay tuned! We will be posting them on social media and the online calendar. Given the state of the world, we are finding that without some effort we fall into a NYTime/NPR/Guardian votex of headline -in the time that could be spend on personal research and inquiry on topics relevant to intervention. Therefore we have been taking the effort to catelog alternative sources of new and learning which can occupy the ‘news curiosity’ in a more uplifting and fulfillling manner You get the drift? Global Sisters Report – news from nuns around the world. Reveal – a podcast from the Centre for Investigative Reporting. 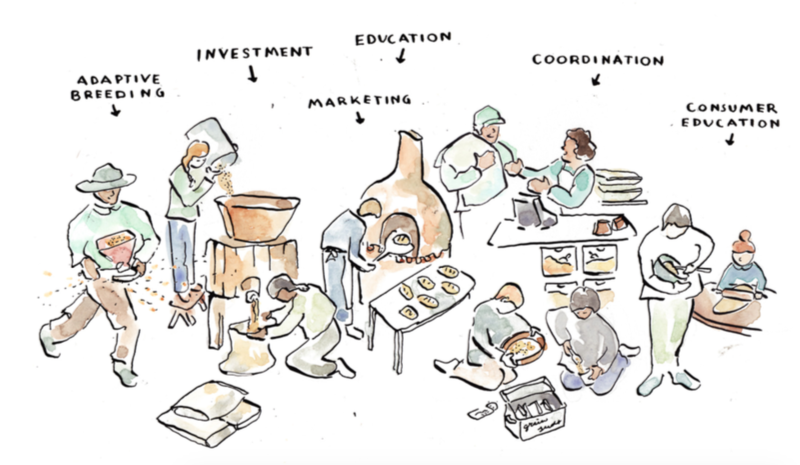 The new food economy – a slightly bitchy new online food and farm news source, we love them! Here is a list of others that you should check out too! Sought: micro-part-time Greenhorns bloggers, please get in touch with Emma@greenhorns.org, blog maven about contributing to our beloved blog. Usually it’s a 1-2 hour a week commitment and gives you a chance to peer into an amazing trove of news items! Looking forward to a very busy summer! Leave a Comment on newsletter: summer schedule….and more!